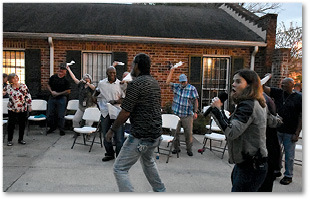 With a pep in their step and a wave of a white napkin, residents of Joseph Homes rose from their seats to join the second line that was dancing to a rowdy rendition of “When the Saints Go Marching In” performed by Mary McBride and her band in front of the complex for parolees on Laurel Street on Thursday, March 14. The impromptu parade of people, which included staffers of Joseph Homes and St. Vincent de Paul, made for an atmosphere of good old-fashioned fun and memories – something that can be in short supply for Joseph Homes’ residents as they try to navigate their way back into day-to-day life in the real world. On any other Thursday evening, the men living at Joseph Homes, a residence for recently released incarcerated men, would be attending a weekly support group meeting. But on this night, support and love came from a different source – music. Linda Fjeldsjo, coordinator for Joseph Homes for Catholic Charities of the Diocese of Baton Rouge, said she was contacted by Charles deGravelles, a long-time volunteer at Angola and founder of Quest for Peace, about Mary McBride, who happens to be his niece, and her band are traveling on the Home Tour. 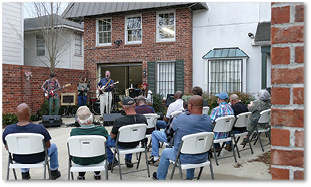 The group performs for people who are displaced from their regular homes. “We’re very happy to be here at Joseph Homes because we have a real commitment to playing both in prisons and for people after they’ve gotten out of prison,” said McBride, who grew up in Washington, D.C. but spent countless summers visiting grandparents in Louisiana.